Keynote speaker announced for DOMAINfest Global. 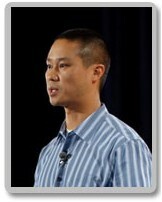 Tony Hsieh, CEO and Co-Founder of Zappos.com, will be the keynote speaker for DOMAINfest Global 2010. The event will take place January 26-28, 2010 in Santa Monica, California. This is a good choice for the show, given Hsieh’s background in internet marketing and domain names. Hsieh founded the popular banner exchange network LinkExchange, which he sold to Microsoft for $265 million. He also understands the value of a category killer domain name, as Zappos.com paid $4.9 million for Clothes.com. Zappos entered into an agreement to be acquired by Amazon.com for $850 million earlier this year. If you plan to attend the event, early bird registration rates are available through the end of September for $895. Prices increase $200 on October 1. Last year, more than 600 people from 26 countries attended the event, making it the largest domain name conference of the year.